TOGAF® The Open Group Architecture Framework, is an industry standard architecture framework that may be used freely by any organization wishing to develop an information systems architecture for use within that organization. It has been developed and continuously evolved since the mid-90's by representatives of some of the world's leading IT customer and vendor organizations, working in The Open Group's Architecture Forum. TOGAF® is available for use internally by any organization around the world - members and non-members of The Open Group alike - subject to license conditions - see About The Open Group Architecture Forum. Why is TOGAF® Certification important? IT customer organizations who wish to base their enterprise architecture work on the open, industry standard of TOGAF®, will be able to procure tools, training, and professional services on the basis of certified conformance with the TOGAF® standards. The existence of a certification program for TOGAF® provides an even stronger incentive for organizations (both private and public sector) to standardize on this open method for Enterprise Architecture, and so avoid lock-in to proprietary methods. 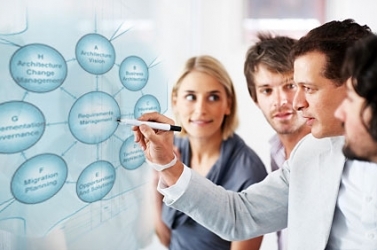 It is an important step in making Enterprise Architecture a well-recognized discipline, and in introducing rigor into the procurement of tools and services for Enterprise Architecture. For architecture service providers and tools vendors, the new certification program provides a way to demonstrate clearly how their services and products support the Enterprise Architect using TOGAF®. For individual Enterprise Architects, TOGAF® certification demonstrates clearly to employers and peers their commitment to their profession as a discipline. In particular, it demonstrates that they possess a body of core knowledge about TOGAF® as an open, industry standard framework and method for Enterprise Architecture. The Open Group publishes the definitive register of TOGAF® certified individuals, and certified service and product offerings, and issues certificates that can be used by vendors in promotion. 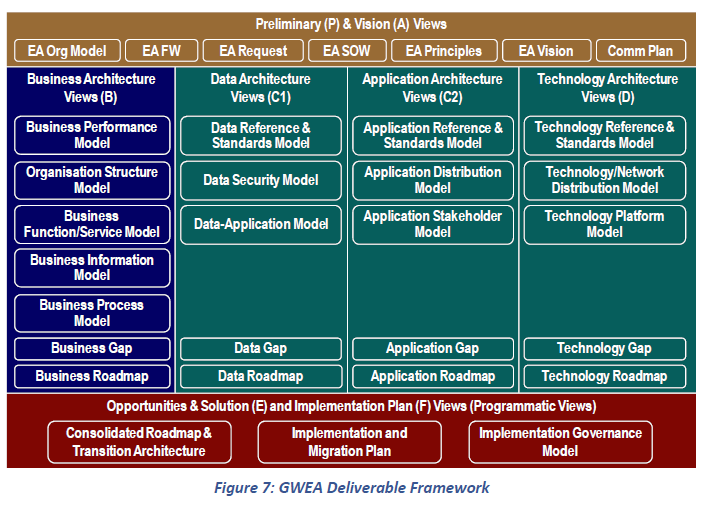 GWEA is the Government Wide Enterprise Architecture framework. It is derived from TOGAF and uses the TOGAF Architecture Development Method for implementing Enterprise Architecture. Its primary purpose is to prescribe a minimum standard for the development of ICT plans and blueprints for government departments and agencies. This in turn ensures that government departments and agencies are aligned to the South African e-government objectives and principles while also ensuring that the ICT plans are fully aligned with the department/agency’s business plan.